Scottish house prices have continued to fall in the latest quarter, according to the Scottish House Price Monitor from Lloyds TSB Scotland, but there are indications that the market is beginning a turnaround. In the three months to 31 July 2009, the quarterly price index for the average domestic property in Scotland fell by 1.4 per cent, substantially less than the 4.3 per cent fall in the previous quarter. Following seasonal and mix adjusting, the average Scottish house price fell from £154,727 to £152,561. On an annual basis, Scottish house prices have now fallen by 6.2 per cent. The volume of house purchase transactions is down 38 per cent on the levels recorded for the same period last year. The number of transactions reached its lowest point in May 2009 but has since been on an increasing trend with the number of transactions in July 35 per cent higher than in May. Similarly, average house prices have increased in both June and July providing further signs of a slight recovery in the Scottish housing market. While all parts of the country are now reporting an annual price fall, ranging from -0.5 per cent to -15.8 per cent, both Glasgow and Dundee have reported price rises in the latest quarter. 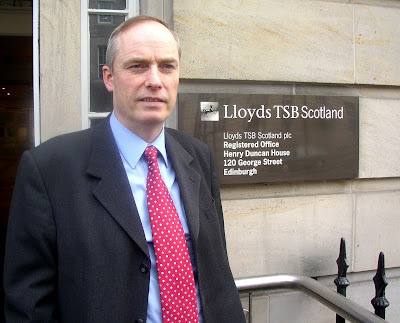 Lloyds TSB Scotland chief economist Professor Donald MacRae said: “There are positive signs that not only has the bottom been reached but that a recovery is beginning to take root. Consumer confidence has recovered with retail sales increasing at an annual rate of +6.6 per cent in June. The housing market reached its lowest point in May recording the lowest number of sales transactions and saw its lowest average price in March. The cost of borrowing has reduced for many mortgage holders while there is a small but perceptible increase in the level of mortgage availability particularly for first time buyers. There are currently 561 Ayrshire business stories permanently archived on this site. To locate those of most interest to you, please use the site search facility in the top left hand corner of this page. Type your search term in the white box, then click “SEARCH BLOG”.